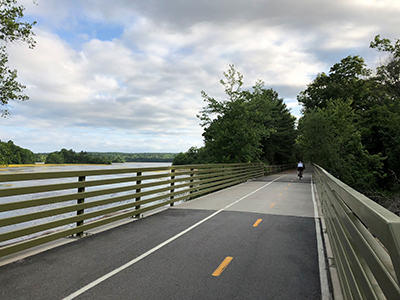 The path is often referred to locally by the segment names given as the path was built, and these include, from west to east: Trestle Trail, Coventry Greenway, West Warwick Greenway, Warwick Bike Path, and Cranston Bike Path. Two more contracts are under design to rehabilitate old rail bridges and complete the path west toward the Connecticut border. When finished, you'll have a 24-mile ride from one end to the other! The bikeway has been built in multiple phases since the late 1990s. As the path follows the former rail corridor, it is mostly flat but has a gradual downhill slope heading from west to east. The greatest elevation change is on the Trestle Trail segment. For more than half its length, the path runs parallel to the Pawtuxet River. Small boat access is possible at several points with formal canoe launches. The trail also features an equestrian trail now open from Route 117 at Old Main Street to Log Bridge Road. The equestrian path sometimes shares the bikeway, sometimes goes off path both north and south of the bikeway. Starting at its northern end, pick up the path behind the Lowe's Home Improvement store on Garfield Avenue, not far from Cranston Street and Route 10. This area is the site of the former Narragansett Brewery. Your ride begins through mostly residential areas, crossing Gansett, Dyer and Park avenues. The next few miles brings you closer to Route 5 (Oaklawn Avenue), with direct access to shops, restaurants and more. Upon entering Oaklawn village, you'll pass a small park and gazebo, perfect for taking a break or getting some shade on a hot day. Heading south from the park, the path enters a mostly wooded section as it nears the Warwick border. At this point, the path runs parallel to the Route 2 commercial district with direct access to Warwick Mall via West Natick Road and Rhode Island Mall at East Avenue. Due to high traffic volume, cycling to the malls is recommended for experienced riders only. The Warwick section of the path brings with it the first of many picturesque river crossings, many of which retain the impressive iron truss work of the original railroad bridges. You'll notice a slight incline of the path as you make your way west. You're treated to views of numerous old mill buildings and waterfalls as you gain elevation. After crossing over a very high trestle near a large mill housing the Bradford Soap Works, keep an eye out for a restored caboose on your left. This is the Riverpoint section of West Warwick, a crossroads of walking trails including the West Warwick Riverwalk to your left and Riverpoint Park on your right. Note: Historic flooding in 2010 destroyed a pedestrian bridge close to the Providence Street end of the Riverwalk. For a longer walk, stay on the bike path until Factory Street, and turn left. The trail head is on the left, after the large bridge. The path winds around the Arctic section of West Warwick, and while it is close to this commercial center, the path is mostly wooded as it makes its way to the Coventry town line. Two more large river crossings are next, each offering great views of the Pawtuxet River. Between them is where the bike path crosses Laurel Avenue, not far from the homestead of General Nathanael Greene - second in command to George Washington in the Revolutionary War. There's also a new shade structure and canoe launch here. More recreational diversions are possible as you continue riding into Coventry, first on the left is the town's Whipple Conservation area, with numerous walking trails. Next up is Paine Field and the Coventry Recreation Center. There are restrooms here, playgrounds for the kids and possibly a bite to eat if a ballgame is in progress and one of the concession stands is open. From this point to the trail's current end, the path runs through a mostly rural, forested part of town. Recent improvements include an equestrian path that runs parallel to the bikeway and sometimes shares the same footprint as the bike path. Highlights include a new spur path to the Coventry Library and access to Johnson's Pond. Past the former end of the path, the bikeway crosses into the Trestle Trail Greenway. 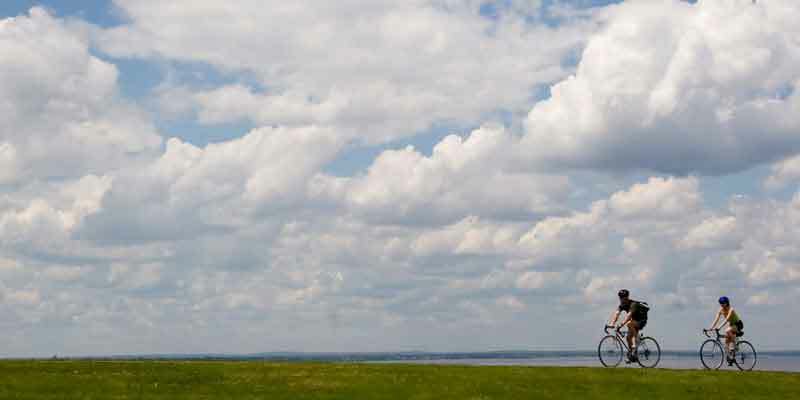 Along this 4.8-mile segment, you'll pass through pristine forested areas, over lakes and streams and by historic rail villages. Look for a series of interpretive panels that describe the history of the area and the former railroad. The path ends at Log Bridge Road near Summit General Store, one of the oldest general stores in Rhode Island. The equestrian path continues for the entire length of the trail to Log Bridge Road. Construction is underway on an undeveloped section of the Trestle Trail. This section in western Coventry will be closed for hikers and other users. The paved section of the Trestle Trail is not affected. The Coventry Greenway and Trestle Trail include provisions for equestrians and small boat users. Read more at left under Features & Riding Experience and check out the links below for parking areas for these uses.